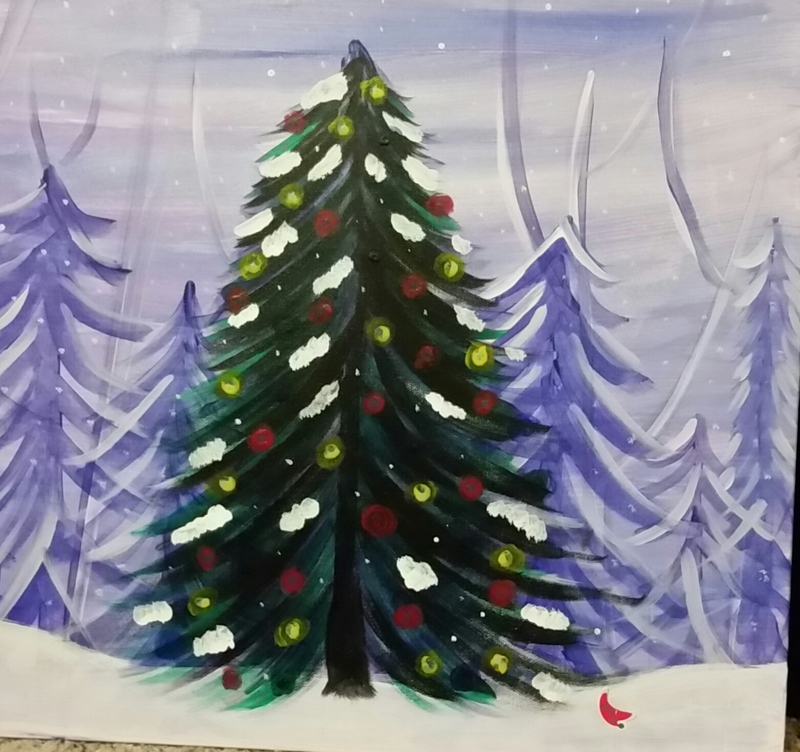 The kick-off party was a blast…I’m so sad you missed it! Santa had a bit too much eggnog and it took all of the elves to carry him to bed. Then a new elf named Spazzy threw sparkles and glitter all over the reindeer. They were not amused. How are you and how was your trip to the South Pole? I had hoped to talk to you before we left for the season, but we had an emergency in the Candy Cane Forest. Do you remember Sparkle? She used confetti instead of sprinkles on the sugar cookies last year and got a bunch of elves sick. Well, she lost her hat in the forest and it had the recipe for Santa’s favorite cookies. You know how cranky he gets if he doesn’t have a dozen Triple Chocolate Iced Peppermint Delights every night before bedtime. We sure missed hearing your ideas in our daily Mischief Planning Meetings. Santa didn’t chuckle nearly as much without you there. I had such fun with you last year and, although I’m happy to be in my own home, I’ll miss our high jinks! My first night was a big hit with the girls! They were so excited to see me and they laughed so hard when they saw what I’d done. Their mom, however, was not amused. At all. I didn’t have a plan ready, and was a little worried that I wouldn’t be able to come up with something as good as last year’s opening night performance. 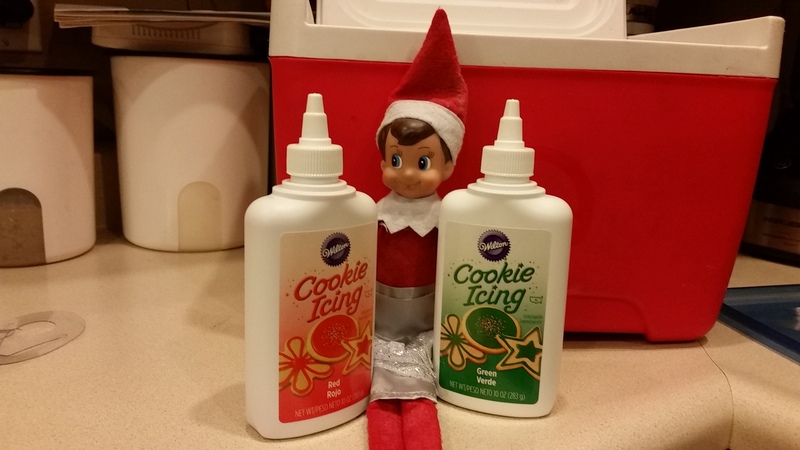 I flew in through the kitchen window and crashed into two bottles of icing that were sitting on the counter. I thought that maybe I’d brainstorm better on a full stomach so I opened up the green icing. After eating about half the bottle it came to me. I took the icing into the bathroom and sprayed it all over the bathtub. I got a little carried away and ended up using it all. I hope they didn’t need it for anything special. 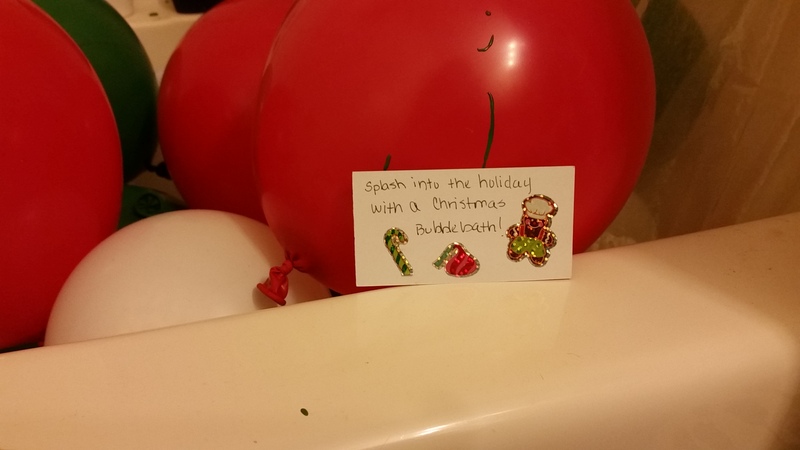 Then, I filled the tub with white, red and green balloons and left a note that it was their “Christmas Bubble Bath”. I found the whole sight so hilarious that I whizzed around the house giggling and singing for hours! I was going to clean up the mess, but I ended up crashing into the wall and sleeping all day. I felt almost as bad as I did on the eve of Joe’s birthday. Do you remember that? We ate way too many sprinkles and doughnut holes that night. We might have been alright if only we hadn’t washed it all down with syrup! Can’t wait to hear your plans for the season!